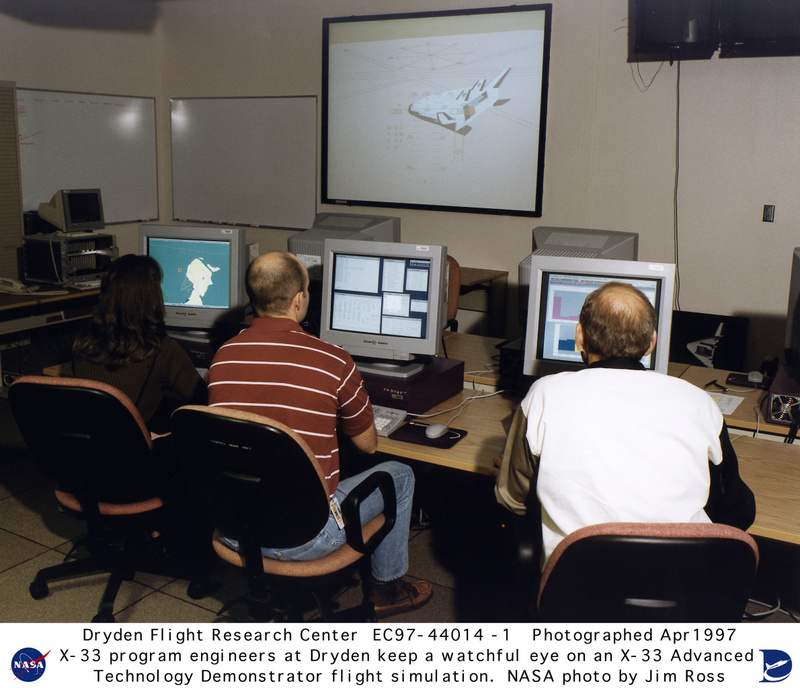 Description: X-33 program engineers at NASA's Dryden Flight Research Center, Edwards, California, monitor a flight simulation of the X-33 Advanced Technology Demonstrator as a "flight" unfolds. The simulation provided flight trajectory data while flight control laws are being designed and developed. It also provided information which was to assist X-33 developer Lockheed Martin in aerodynamic design of the vehicle. The X-33 program was a government/industry effort to design, build and fly a half-scale prototype that was to have demonstrated in flight the new technologies needed for Lockheed Martin's proposed full-scale VentureStar Reusable Launch Vehicle. The X-33 design was based on a lifting body shape with two revolutionary "linear aerospike" rocket engines and a rugged metallic thermal protection system. The vehicle was also to have had lightweight components and fuel tanks built to conform to the vehicle's outer shape. Time between X-33 flights was planned to normally be seven days, but the program had hoped to demonstrate a two-day turnaround between flights during the flight-test phase of the program. The X-33 was to have been an unpiloted vehicle that takes off vertically like a rocket and lands horizontally like an airplane. It was to have reached altitudes of up to 50 miles and high hypersonic speeds. The X-33 Program was managed by the Marshall Space Flight Center and will be launched at a special launch site on Edwards Air Force Base. Due to technical problems with the composite liquid hydrogen tank, the X-33 program was cancelled in February 2001, before any launches were made.